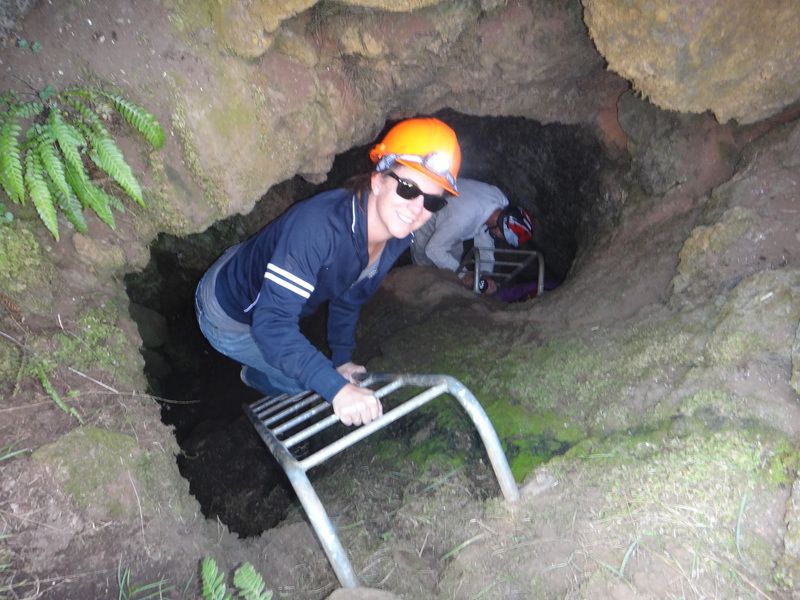 Earlier this year, I received an email saying that the Auckland branch of the GeoClub had organised a trip down into the depths of the Earth. 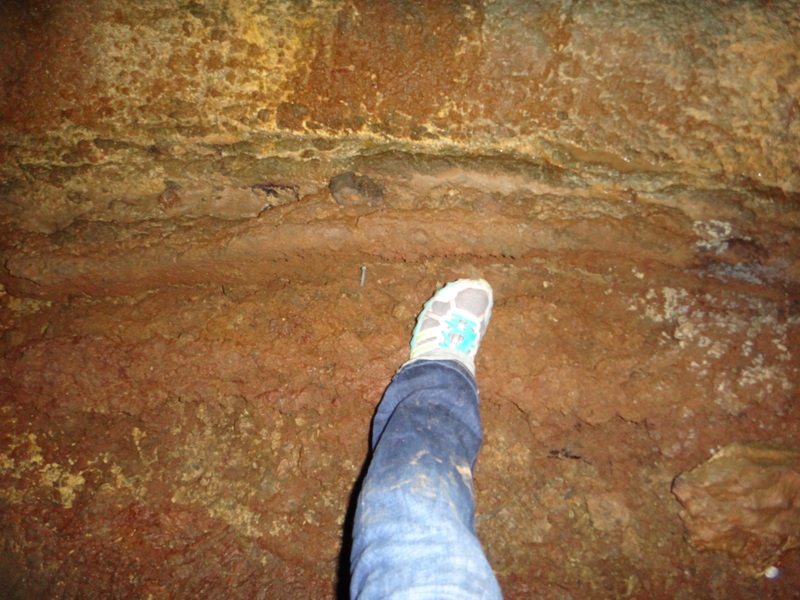 Specifically, into one of the longest lava tubes underneath Auckland, Wiri Lava Cave. 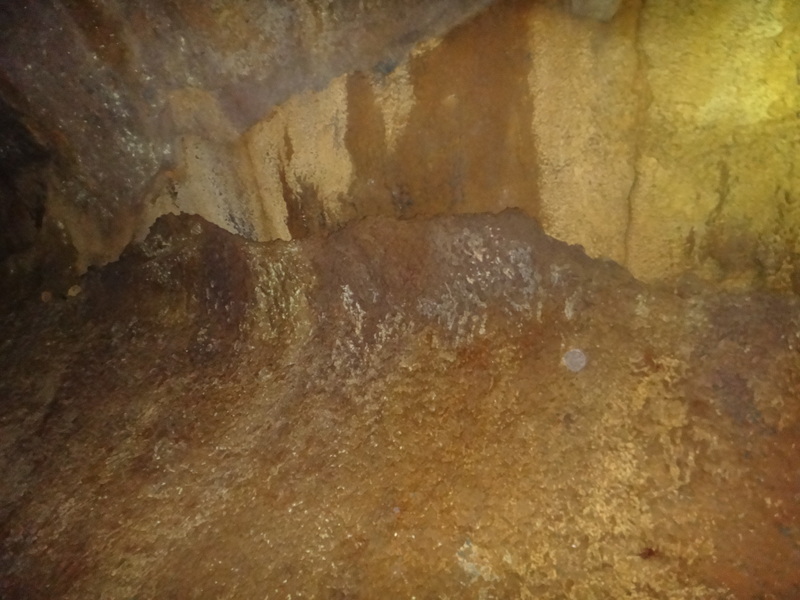 Not many people get to go down there, and they had secured permits and an iwi blessing to enter the cave–it is locked with a metal grate at the entrance and, until very recently, no one had gotten permission to enter it since 1998! The GeoClub folks (led by Bruce Hayward, whom I consider the Godfather of all things Auckland Volcanic Field) also arranged for a cave expert, Peter Crossley, to guide us around. These opportunities for adventure are just one of the perks of the job. I’m happy to get to share them here! 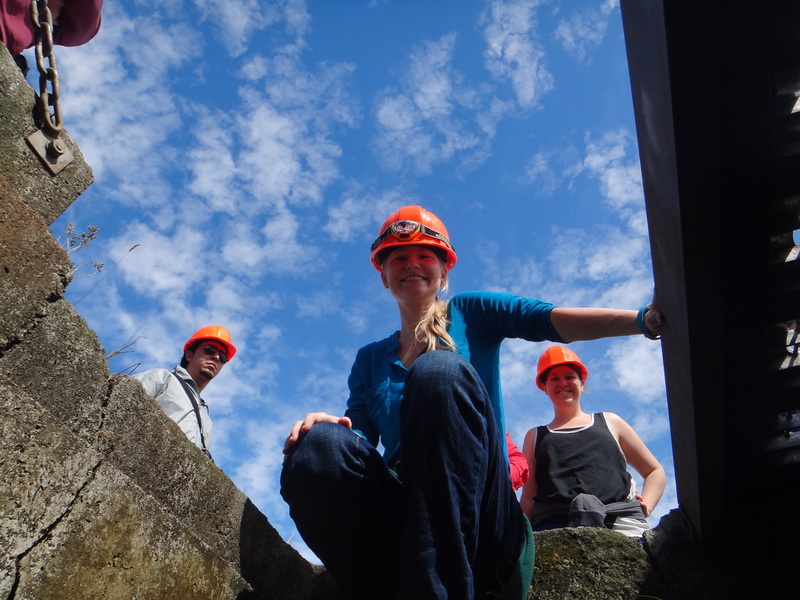 I excitedly gathered a group of keen volcanologists from Auckland Uni to go. But first, of course, we had to learn some specifics about what we were seeing. Bruce explained how the cave entrance and lava tube we were about to travel through was once covered by a large scoria cone. The cave is still surrounded by scoria. Unfortunately pictures of the original cone do not exist; by the time they took any pictures of it in the 1940’s, parts of it had already been quarried away. The quarry is still there (not pictured). 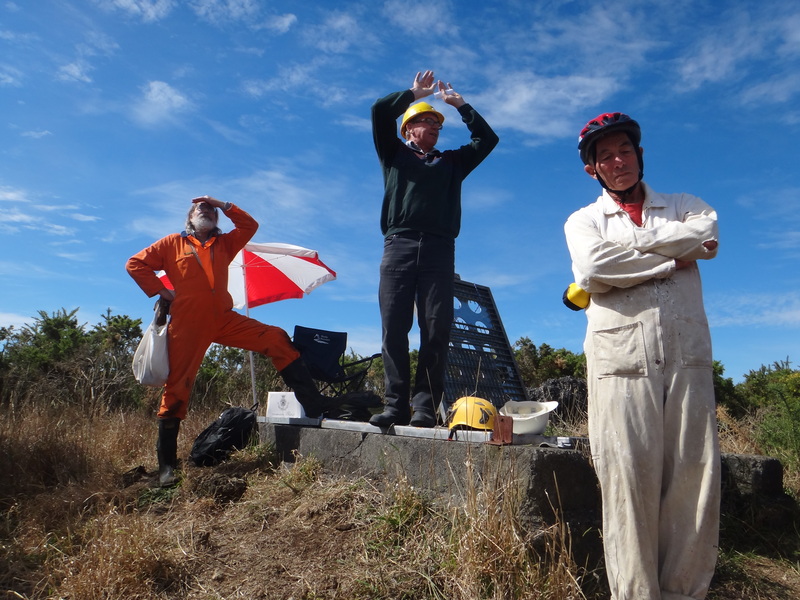 Bruce (centre) gestures to help us visualize the large scoria cone that used to be where we are standing, prior to quarrying. Then…we ENTER! 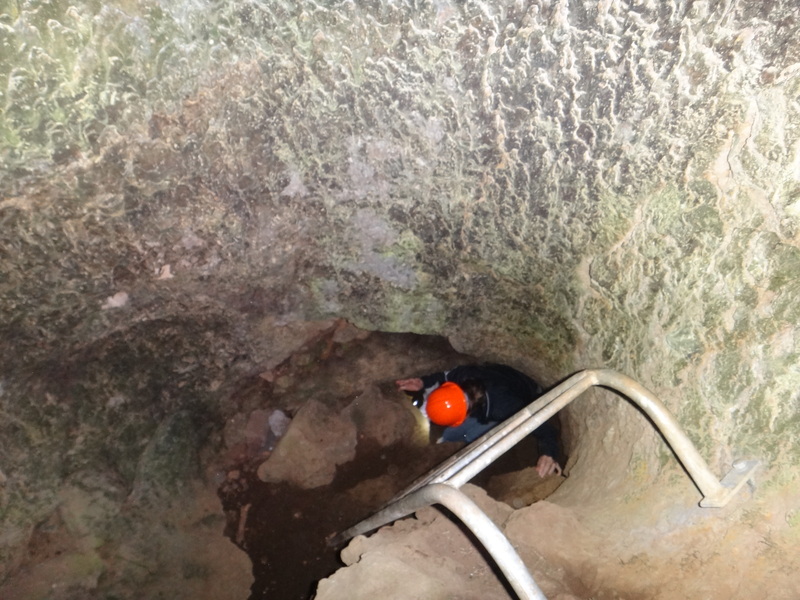 Some modification of the cave entrance meant that we had ladders to climb down into the tube. 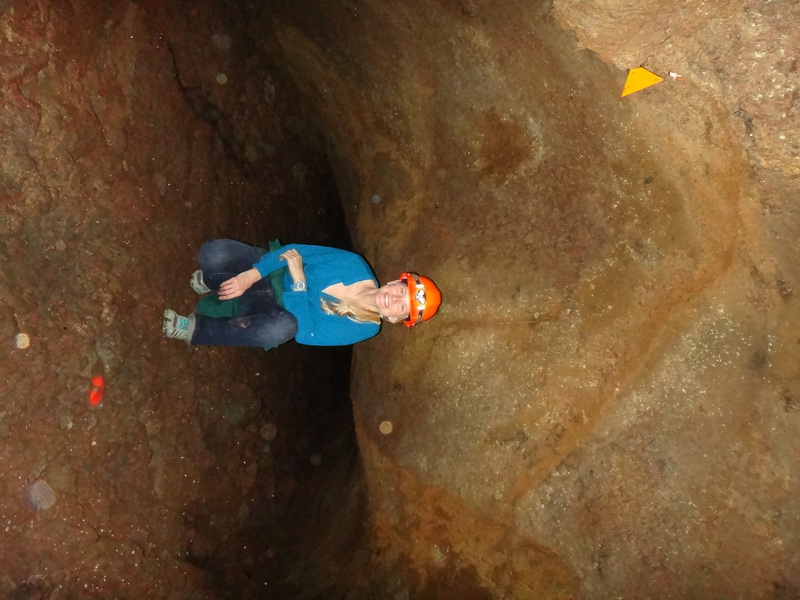 Here, my boss (Jan Lindsay) demonstrates that she is so cool, she even wears shades when climbing into caves. 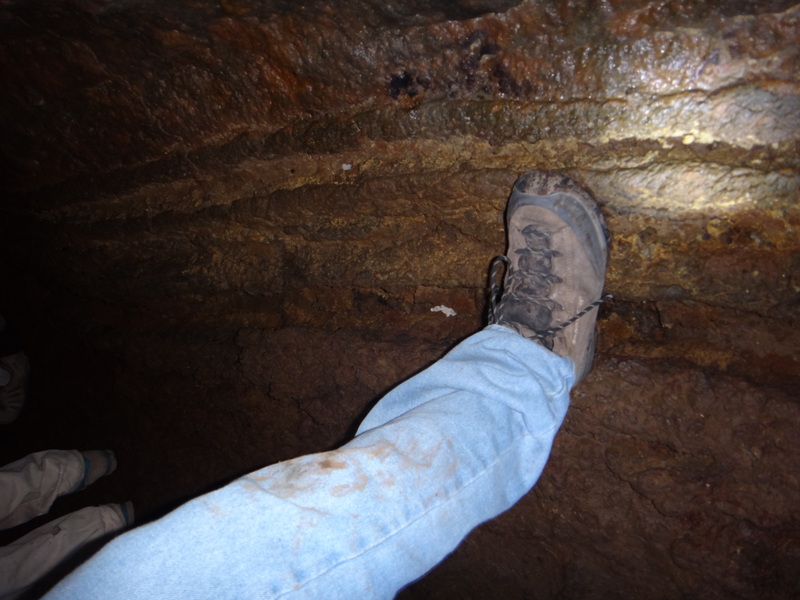 Jan’s perspective, looking up at us from inside the lava tube entrance. One ladder down, one more to go. After that there is a little bit of a scramble a few meters down even further. After which there is a little bit of a duck-crawl for about 10-15 meters before getting to a larger tube where you can stand up. 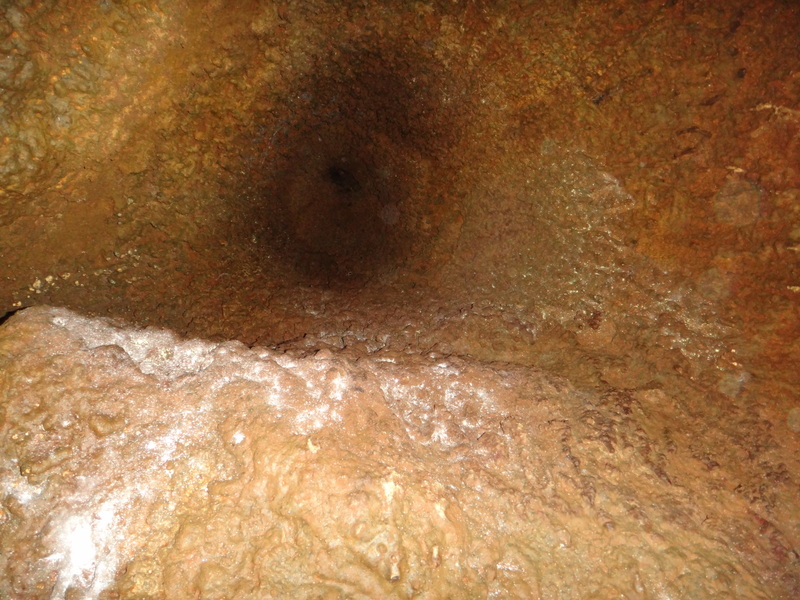 After crawling for a bit, it is a relief to enter a large cave tall enough to stand in. Notice the pointy roof–Bruce thinks it is not rounded (as expected) because while the roof was still plastic, flexible, and hot, the weight of the overlying scoria pushed it inward. Sounds right to me! Still no consensus on what that shiny yellow biogenic stuff on the walls is. We need a biologist, STAT! This was taken looking straight up. 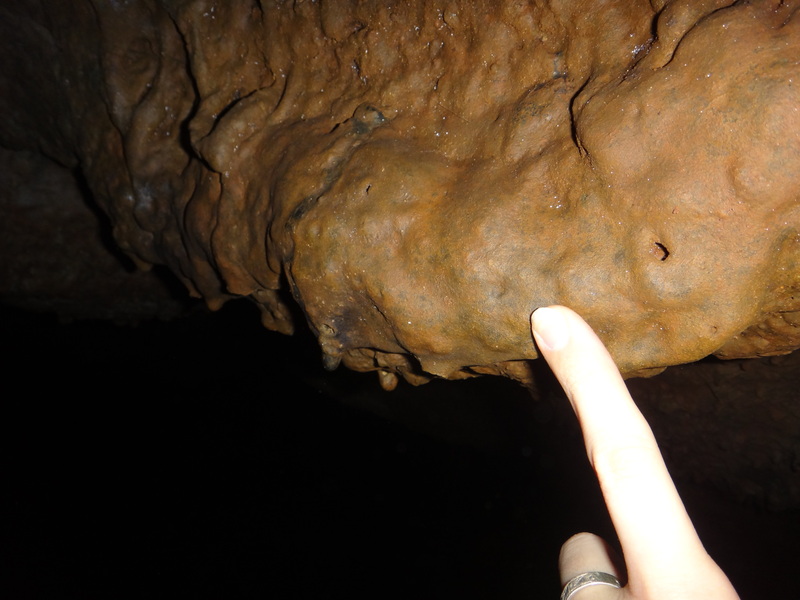 The gases and lava tried to push its way through the lava tube roof and scoria to the surface. It didn’t quite make it. This is how horitos form (http://volcanoes.usgs.gov/images/pglossary/hornito.php). 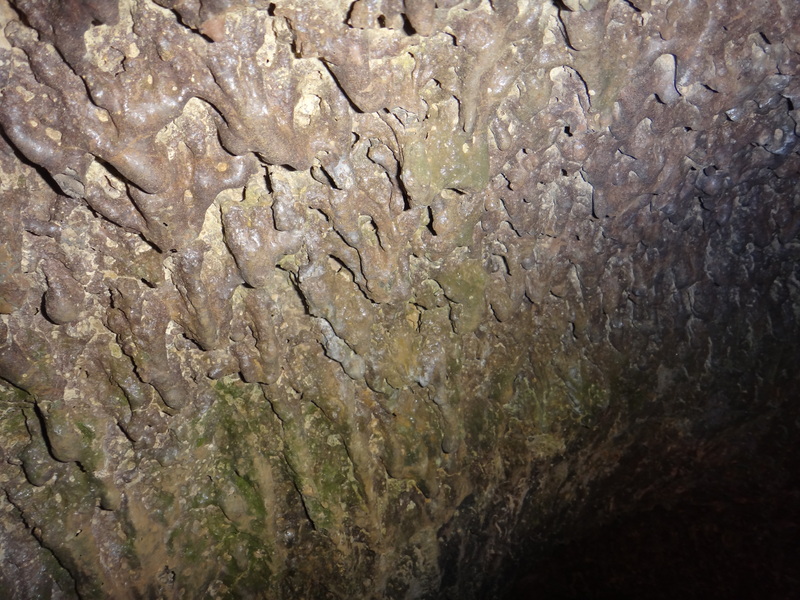 The walls of the cave are just a thin (maybe a few cm thick? ), melted coating of lava, surrounded by pieces of scoria. Ropy textures on the cave floor mark the edges of the channels where the lava flowed, and allow you to see ‘high-tide’ marks of where the lava level rose and then drained away on the bottom half of the walls, and the ‘runway’ of the last dregs of magma on the floor. Such amazing textures!! ‘High tide’ marks of the last few lava flows to come through the tube. Or it could be where some of the thin lava cave walls broke off. It also allows you to see how thin the lava coating is. There is some graffiti from surveyors in the tube, unfortunately. 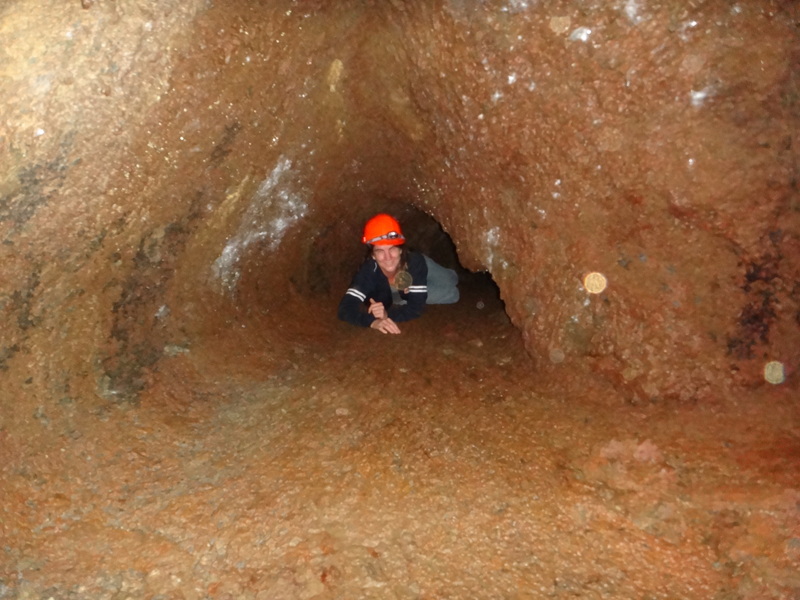 Here I am just before ‘The Squeeze’ and right before my claustrophobia kicks in. It gets quite narrow here. Again, you can see a survey marker above my head. Ropy texture of the tube floor. 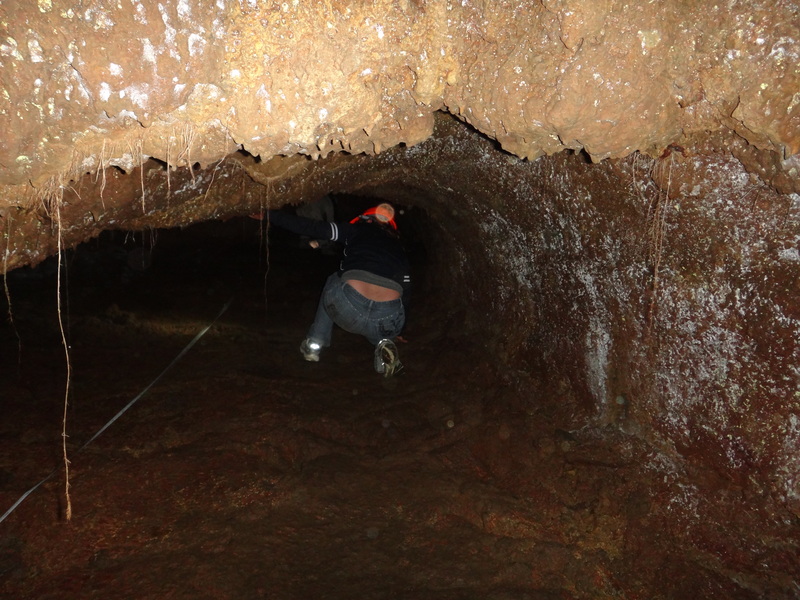 Upon turning around and heading back to the surface, Jan took an alternate route through a small channel in the lava tube. 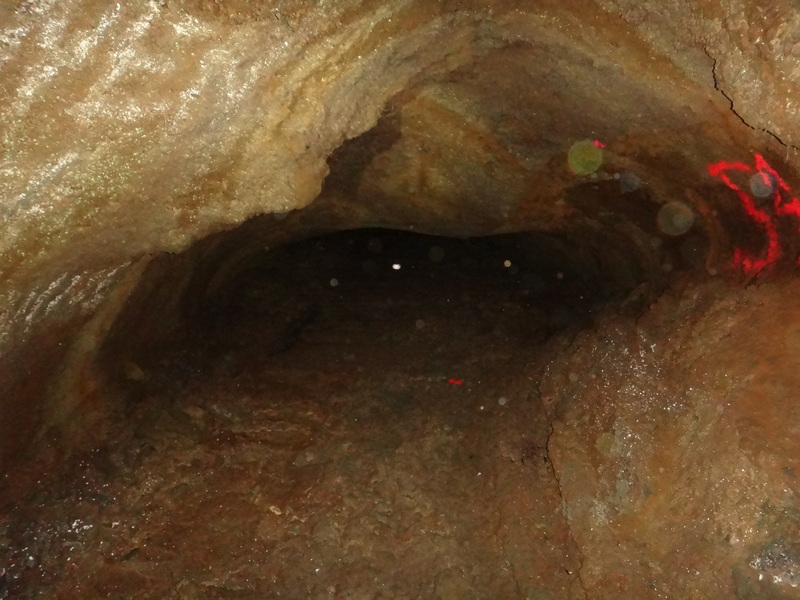 There are a lot of lava tubes in Auckland that are publicly accessible, though not as extensive as this one. Rangitoto, for example, has a few if you are brave and prepared enough to explore them while you are over there! It was a really great day exploring this hidden geological wonder right here in our backyard. I just want to thank the Auckland GeoClub once again for arranging this truly exciting, one-of-a-kind outing. Happy lava-tube exploring! This entry was posted in Fun, General, Geological by cityofvolcanoes. Bookmark the permalink. Thank you so much for your comment. I’m very grateful for the time you dedicated to saving and maintaining this special feature of the Auckland Volcanic Field! THANK YOU! It is spectacular–so many unique features! Other than the surveyor’s unfortunate spray-painted marks, it was pristine. 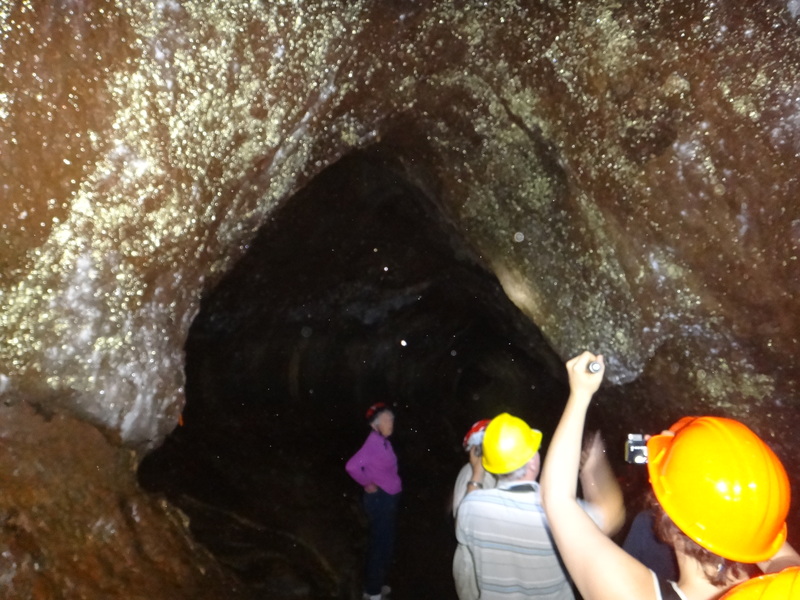 We were very excited about our field trip through the lava tube–so very honored to be one of the few to explore it. We were able to get access through the Auckland branch of the NZ Geoclub–doubtful that you aren’t familiar with him already, but B. Hayward is the person to chat to to get info about access. I’m sure he’d also like to chat to you about your efforts as he is very active in preserving natural heritage features. Who was your geologist friend?